Downtown Athens is decorated in green but thats not the only kind of green this holiday brings in. Green drinks for the customers and green money for the bars. Troy Aubrey and Kyle Kilo of The Foundry talk with our Grady Newsource Reporter, Jacob Blount about the 10th annual St. Patrick’s Day celebration that will take place tonight. 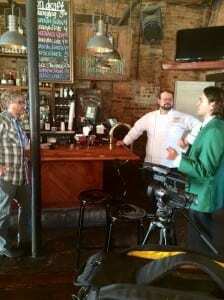 He also talks with four other local Athens bars who tell us how much money this lucky irish holiday brings to them. Jacob Blount is downtown in the classic city and will be there tonight during the parade to bring you the latest on how much money this holiday brings in for the bars here.